Blue’s ArtHouse recently completed a new website for Broken Bow Livestock & Brott Auction Service, a livestock auction business operating out of Gothenburg, Nebraska. For this website we incorporated a WordPress template created specifically for events to promote Broken Bow’s weekly auctions. 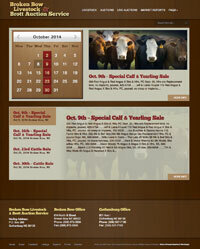 A dynamic calendar on the front page highlights their upcoming auctions.